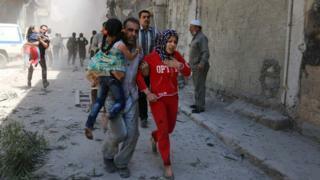 Syria's divided second city of Aleppo had endured another day of deadly clashes. State media said rebels shelled a mosque in the government-held district of Bab al-Faraj, killing 15 people. In the rebel-held east, government air strikes reportedly left at least 11 dead and destroyed a medical facility - the second to be hit in a week. The military meanwhile said a "regime of calm" would begin elsewhere at 01:00 on Saturday (22:00 GMT on Friday). A statement said it would last for 24 hours in Damascus and the Eastern Ghouta region outside the capital, and for 72 hours in the northern countryside of Latakia province. It did not explain why the halt was only temporary, nor was there any mention of Aleppo, where a week of escalating violence has left more than 200 civilians dead. Has opportunity for peace been lost? State television said rebels unleashed a barrage of rocket fire into the government-held western part of Aleppo just as people were coming out of Friday prayers. The Malla Khan mosque in Bab al-Faraj was hit, it said, causing heavy casualties. Some of the injured were in a serious condition and were likely to die, it added. Activists meanwhile reported that government aircraft carried out more attacks on rebel-held parts of the city, after hostilities had eased for a short time overnight. The Syrian Observatory for Human Rights, a UK-based monitoring group, said 11 people were killed, while the Local Co-ordination Committees, an opposition activist network, put the death toll at 14. The LCC reported that six died when government helicopters dropped barrel bombs - large cylindrical containers filled with explosives and shrapnel - on the Firdous district and four others in a barrel bomb attack in Mughair. The Syrian Civil Defence, whose volunteer emergency response workers are known as the "White Helmets", said that among the sites targeted by warplanes was a clinic in the Marja area. A nurse was among several people hurt. On Wednesday night, the al-Quds Hospital in the rebel-held Sukkari district was destroyed in air strikes that US Secretary of State John Kerry said appeared to have been "deliberate". Medicins Sans Frontieres (MSF), which supported the hospital, said on Friday that 50 people, including six members of staff, were now believed to have been killed. Media captionDr Vickie Hawkins, executive director of Doctors Without Borders: Attack on hospital is "absolutely devastating"
"The attack on al-Quds Hospital has destroyed one of the last remaining places in Aleppo in which you could still find humanity. Aleppo is already a shell of what it once was, this most recent assault appears determined to eliminate even that," said MSF's head of mission in Syria, Muskilda Zancada. Ms Zancada also expressed concern at reports that government forces were preparing for a major offensive to encircle rebel-held areas of the city. The International Committee of the Red Cross (ICRC) warned that Aleppo was being "pushed further to the brink of humanitarian disaster". Large parts of the city have been destroyed and its infrastructure has been severely damaged, leaving civilians without water and electricity for months. In an interview with the BBC, UN Secretary General Ban Ki-moon called on Syria's leaders had to "go beyond their narrow personal perspectives" and call a halt to the destruction of their country. "How long are they going to fight? They are destroying their people and infrastructure. How will this be resolved?" he asked. The UN High Commissioner for Human Rights, Zeid Raad Al Hussein, said the failure of the Security Council to refer the situation in Syria to the International Criminal Court was "an example of the most shameful form of realpolitik". "In the minds of a many, the world's great powers have in effect become accomplices to the sacrifice of hundreds of thousands of human beings, and the displacement of millions," he added. Russia and the US are backing opposing sides in the conflict. The latest reports from Aleppo have alarmed regional media outlets opposed to the Syrian regime, with fire being the image of choice. "Aleppo is burning" reads a stark headline in the Saudi paper al-Riyadh, while an editorial in the Lebanese daily al-Mustaqbal accuses President Bashar al-Assad of "burning Syria while the whole world watches". An Arabic hashtag translating as "Aleppo is burning" had been re-tweeted more than 180,000 times by Friday morning. In Syria itself, Nasser Qandil, in pro-government al-Thawra, warns rebels in the city that a "war of all wars" will be unleashed on them in the coming weeks. Many regional commentators fear the worst in Syria's second city, with London-based Arabic paper al-Sharq al-Awsat predicting a "war of annihilation" by government forces. Meanwhile Maher Abu Tair, in Jordan's al-Dustur, criticises the wider Arab and Muslim world for "standing and watching the carnage", while Asaad Haider in al-Mustaqbal argues the "world cannot remain blind in the face of a catastrophe".